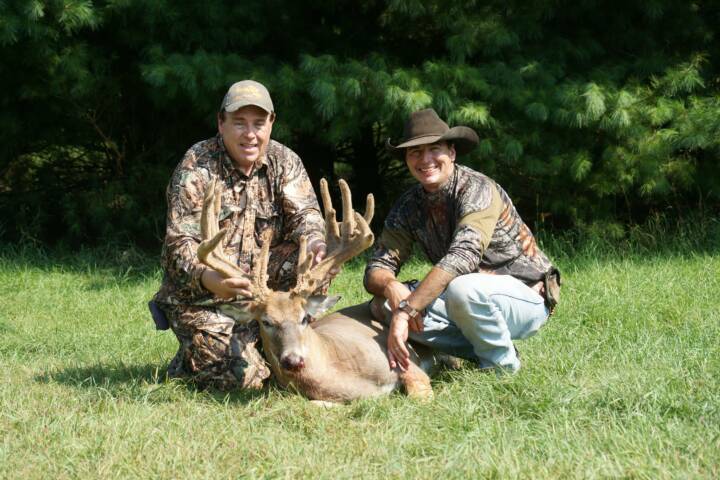 As a professional taxidermist the nature of my business has allowed me to come in contact with many individuals with all different experiences in the outdoors from all corners of the world. I myself have had the opportunity to enjoy some of these adventures and wish to share with those who desire.I am not nor pretend to be a broker, booking agent or a professional hunter. 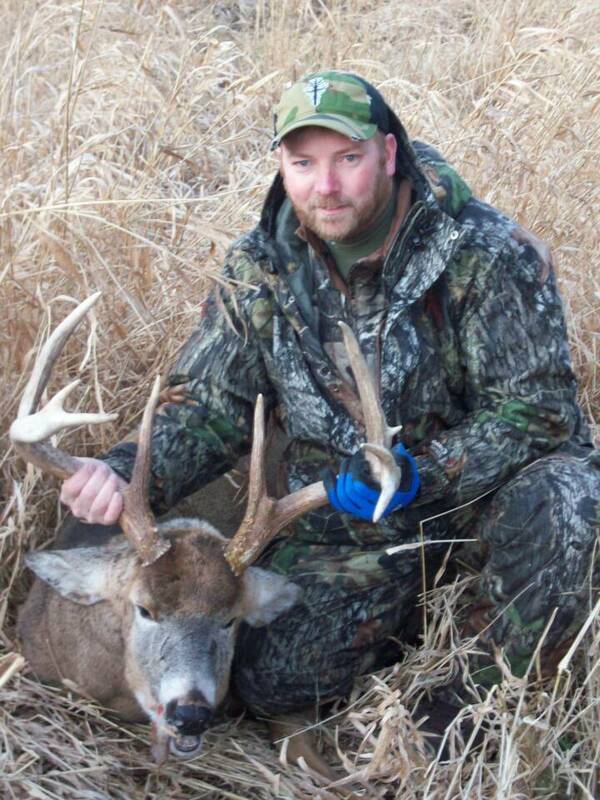 I am a Taxidermist and an outdoorsman who wishes to see others be successful in their quest for their TROPHY. I have listed these resources below with a brief description. In some instances there may be special offers that may apply, click on Special Offers to see what may be available. 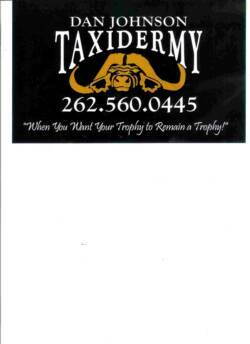 If you are looking for a special trophy and need any assistance finding it please feel free to contact me anytime. Thank You. Comstock Lodge is located in Sargent,Nebraska. 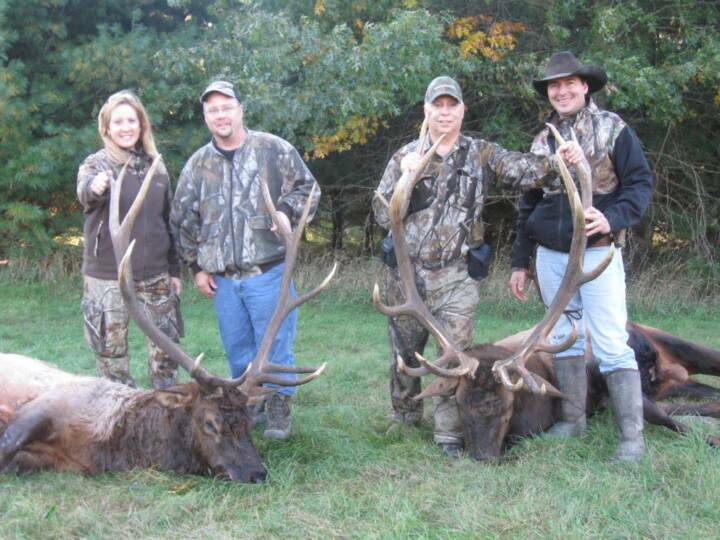 Mitch and Roxanne Huggins own and operate this 3,000 acre estate Elk ranch. 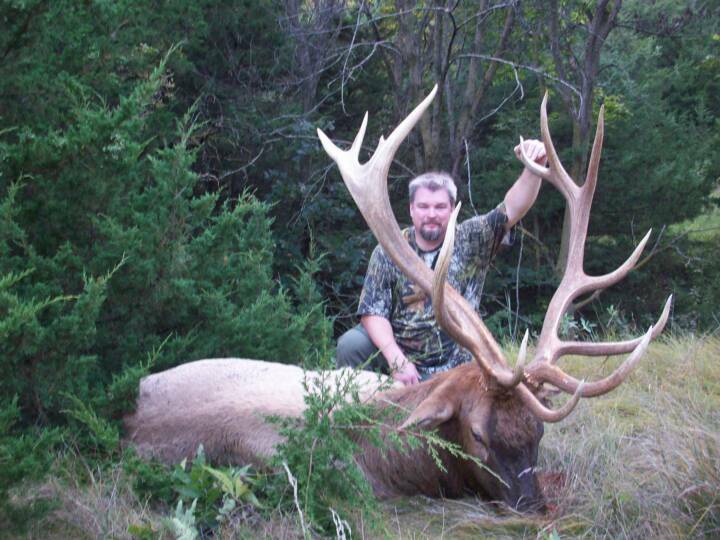 When you think of Nebraska you think of endless open fields but when you reach the center of the state you will see a drastic change in the landscape.Rugged hills and canyon country which they call the "Bohemian Alps" is what you will find at Comstock.In 2009 I took a beautiful 7x7 elk which scored 341" the largest trophy in my personal collection.The rugged terrain offered a very challenging hunt.I have a long list of customers that also have enjoyed the Comstock lodge and brought home some beautiful trophies.Mitch and Roxannes hospitality is second to none. If you are looking to work on your Grand Slam of turkeys you can find plenty of Merriams,Rios and Easterns running around on over 7000 acres. 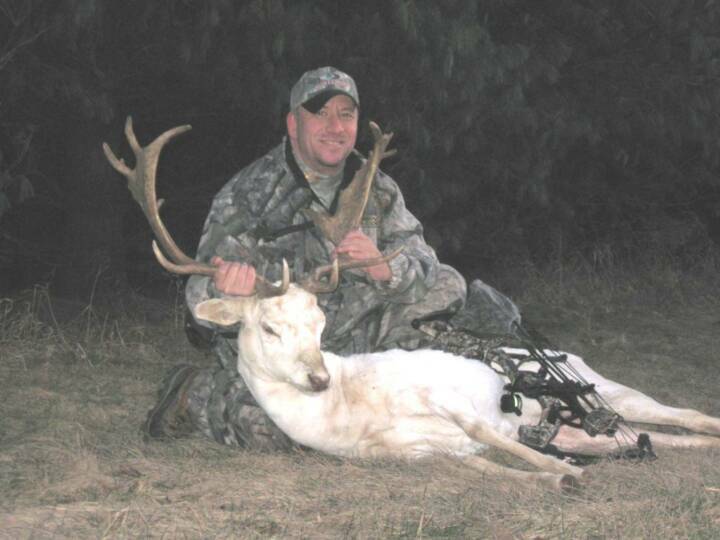 They also offer trophy Whitetail and Mule deer hunts. For more information on the Comstock Lodge visit www.comstocklodge.com or call Mitch and Roxanne at 1-866-486-8631 and tell them Dan Johnson sent you. 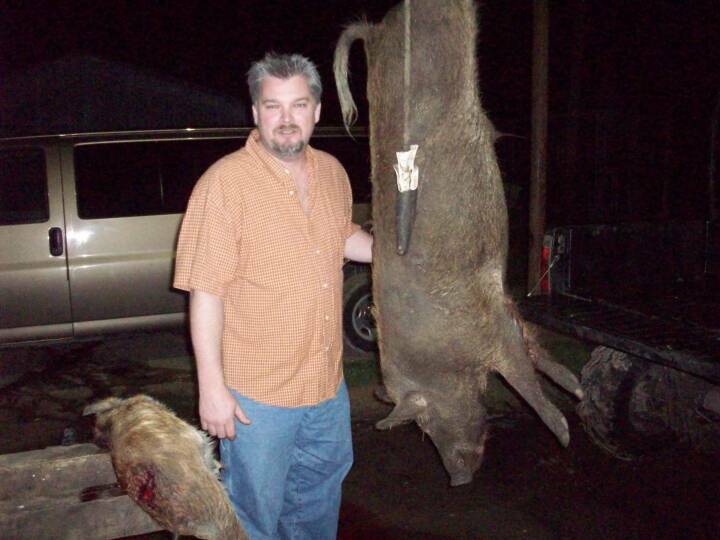 Wild Hog Hunting-The Bigwoods is located in Tennessee Colony Texas app. 90 miles south of Dallas.You know what they say about everything is "BIG" in Texas. Dr.Bobs hospitality is about as big as the 14,000 acres he has for hog hunting.I personally have been hunting at the Bigwoods since 2007. We have 2 big groups of 15-16 hunters from Wisconsin that make a pilgrimage to the Bigwoods between the months of January and April to shoot some Hogs.This is some thick, wet,thorny river bottom woods that can swallow you up in minutes.With no shortage of hogs due to their prolific nature you will surely enjoy your time there.Hunting is done frome blinds that the staff will take you to and pick you up from. They will skin and quarter your hog for you also. No limits on Hogs! 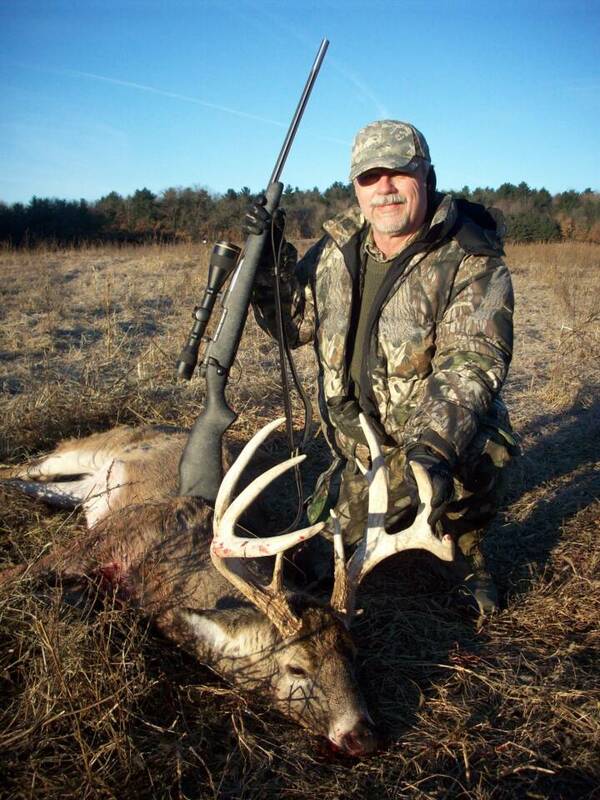 Dr. Bob also has hunting available for ducks and whitetail deer during regular Texas seasons. You will find no shortage of wildlife at the Bigwoods.Along with the hogs it is not uncommon to see numerous raccoons,armadillos,coyotes,bobcats and possibly cougar and alligators.This is not a game farm so please follow Texas hunting regs accordingly and when in doubt ask the Doc. 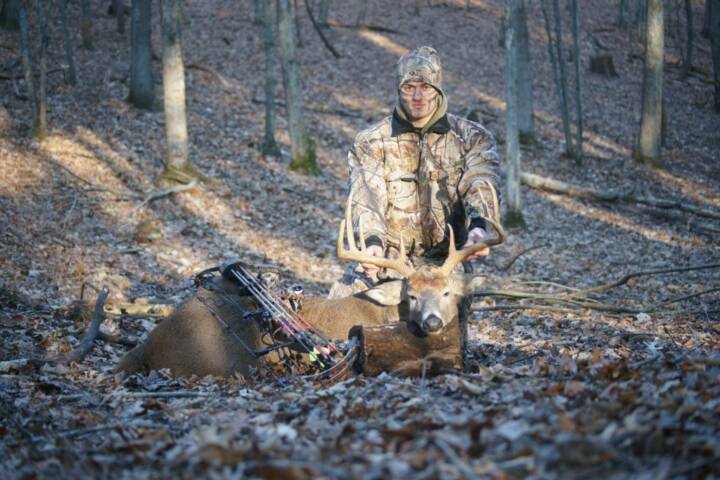 Hunting is usually done early mornings and late afternoons well into the dark. I highly reccommend predator type lights to see your targets as daylight fades. Due to hunting pressure and the intelligence of the hogs they tend to like to come out as the sun goes down. During the heat of the day the hogs like to rest so you may shoot your guns at his rifle range that goes out to 500 yds or enjoy some fishing on his ponds.You may just want to relax like the pigs. 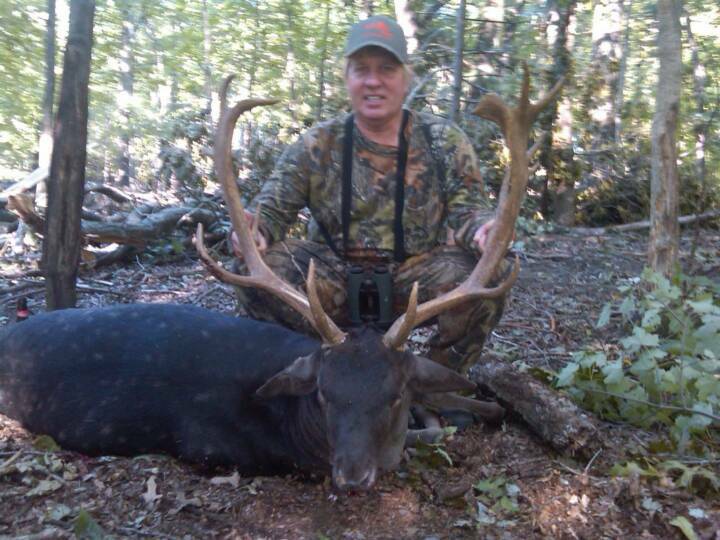 For more info on "The Bigwoods" visit www.bigwoods.ws and tell him the Cheese heads from Wisconsin sent you. Alligator Gar Fishing- If you made it to Texas to shoot hogs,then make some time to catch one of Americas fiercest looking fish.You can shoot them with bow and arrow or catch one on rod and reel.These fish come from the Trinity River which borders the "Big Woods".A Gar Fishing Adventure can be set up with Legendary "Bubba Bedre" who has been featured on the TV show "River Monsters" with Jeremy Wade. Bubba will definitely entertain you with his river knowledge and a memorable boat ride in his custom airboat. The large gar was 6' 7" long and close to 150lbs. 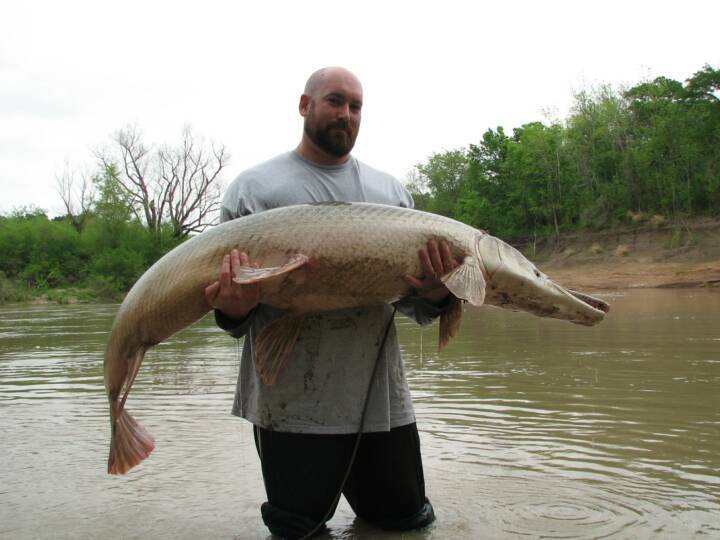 The second largest gar was 5'5" app. 80lbs. and both were caught by fellow hog hunters. Numerous gar were caught and landed that day and "Bubba" did his best to make sure both fisherman got a trophy fish . Deep Sea Fishing Ixtapa/Zihuatanejo Mexico. Located on the Pacific coast, this Mexico destination does not share the hustle and bustle of that of the Cancuun area. Ixtapa has resorts right on the ocean and hosts some night life,shopping,golf and plenty of restaurants. Fifteen minutes south of Ixtapa you will find the town of Zihautanejo which has a large coastal bay where cruise ships will come to stop and drop off tourists and where most of the fishing charters leave from.If you are in search of Sailfish or Marlin I highly recommend you see and ask for the Vargas Sporting fishing group. A fleet of 6 boats owned and operated by brothers they probably have at least 100 years of fishing knowledge between them. 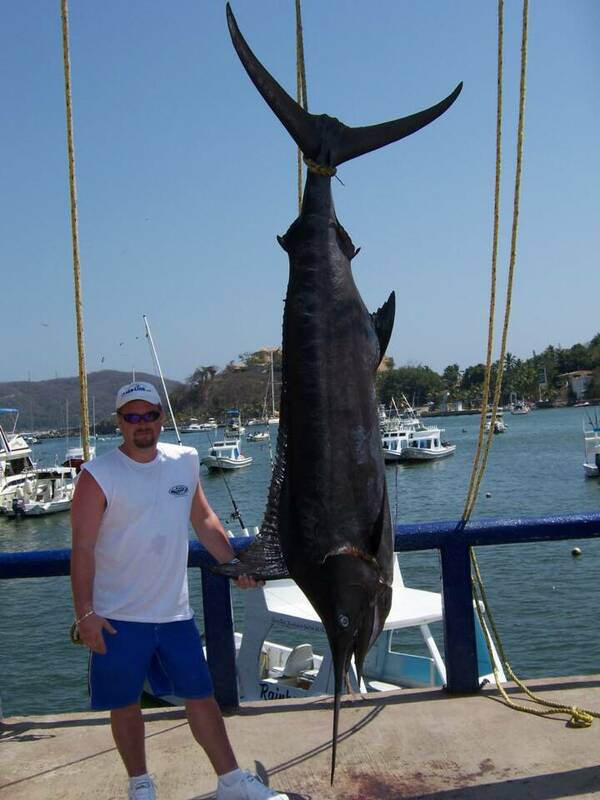 In 2006 I personally caught a 100" sailfish and a 10' 4", 325 lb Marlin on 2 seperate trips. I did catch other Sailfish each day but the 100" was my biggest. 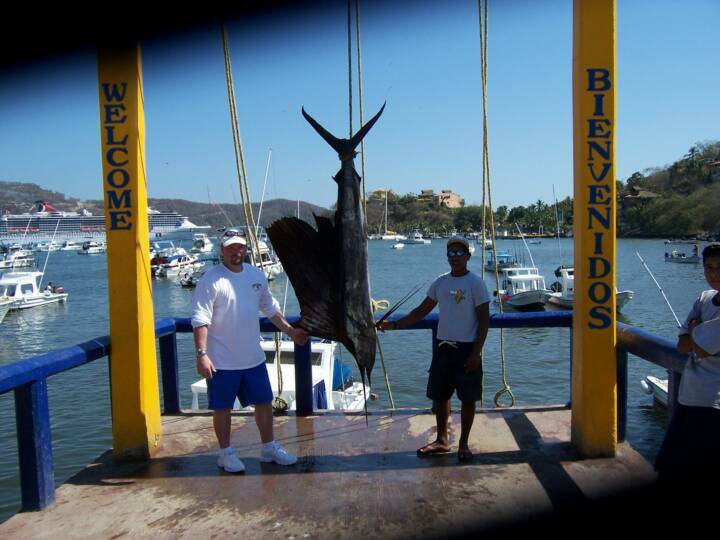 I fished with Captain Javier Vargas on the "Marlin Azul" and chartered the boat for the whole day trip. Everthing was provided along with beer,water and soda. I highly recommend their charters and was referred to them myself by one of my customers.Rates are very reasonable and in some instances cheaper than inland lake fishing with local guides in my area. For more info visit- www.zihautanejofishing.com Definitely more than just a boat ride! Side note: The Vargas group highly promotes catch and release and although we did release several other fish, due to circumstances out of their control we were not able to revive my marlin and one sail. I personally recommend catch and release of all billfish whenever possible and recommend having a replica made of any/all saltwater fish stateside. For info on fish replicas visit my Fish-Replicas page. 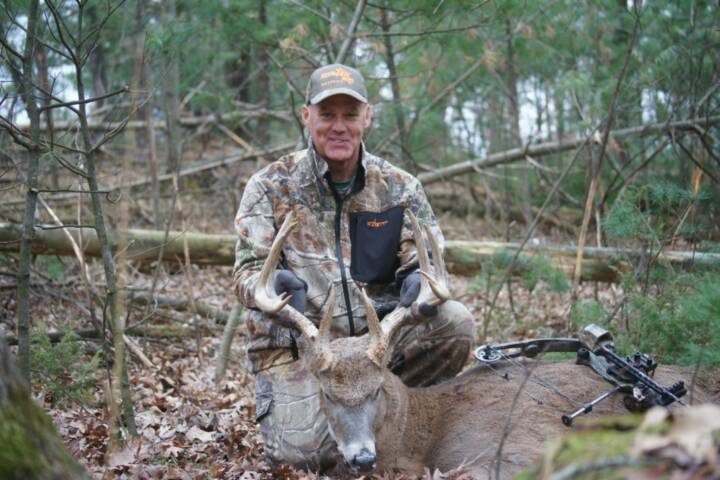 Little Texas is located in Wautoma, the heart of Wisconsin which has a diverse hunting terrain including deep valleys,marshland,hardwoods,waterholes,ponds,oak ridges and lush food plots. 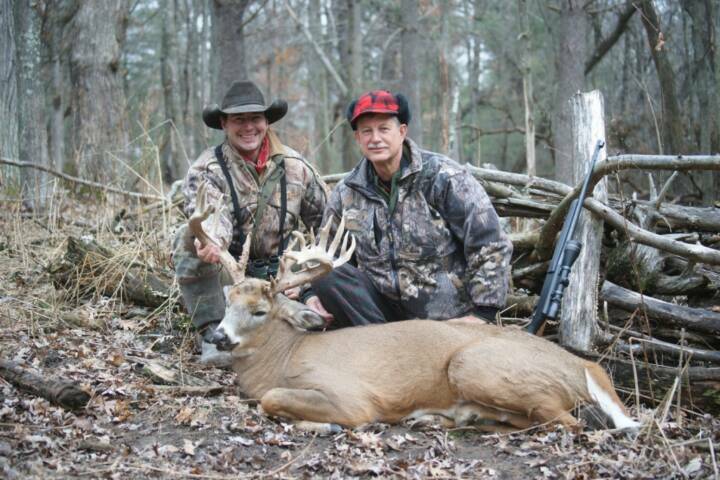 This large estate holds all that makes Wisconsin famous for Hunting. 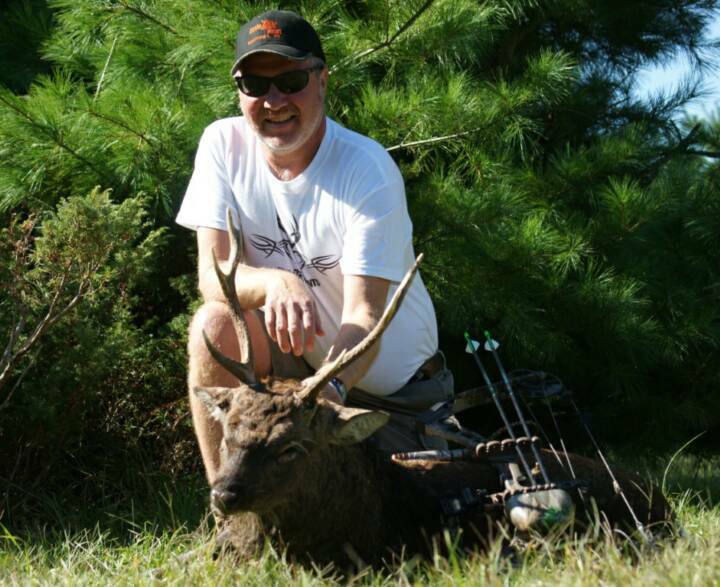 Not only will you find Trophy Whitetails but also Trophy Elk,Fallow Deer and Sika Deer. 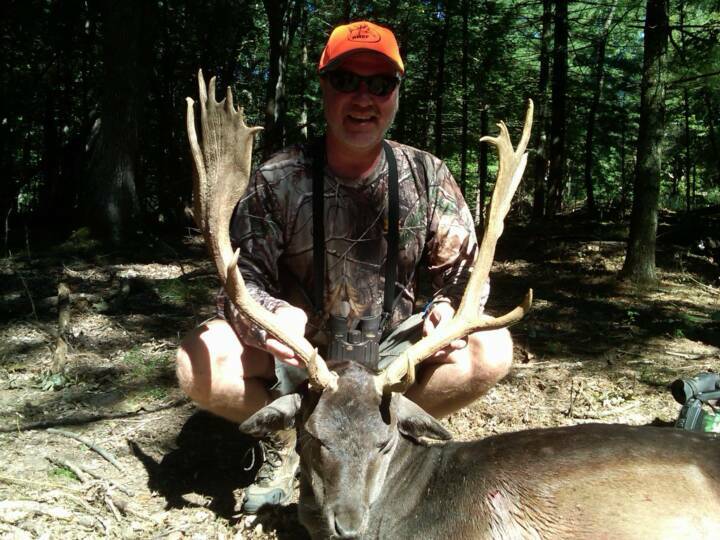 These hunts offer you (5) days of hunting,meals,lodging,professional experienced guides, field dressing and much more. I am proud to announce that Dan Johnson Taxidermy has been selected as the reccommended Taxidermist for Little Texas Ranch and look forward to working with them and their customers. I have personally visited the Little Tex Ranch and would highly reccomend them to anyone. Managers Lisa and Forrest will not only be your hosts but as very accomplished hunters will guide you to a Trophy of your dreams. For more information call Lisa or Forrest at 1-(920)-574-4641 or visit www.littltexhunts.com and let them put together a custom hunt package for you. 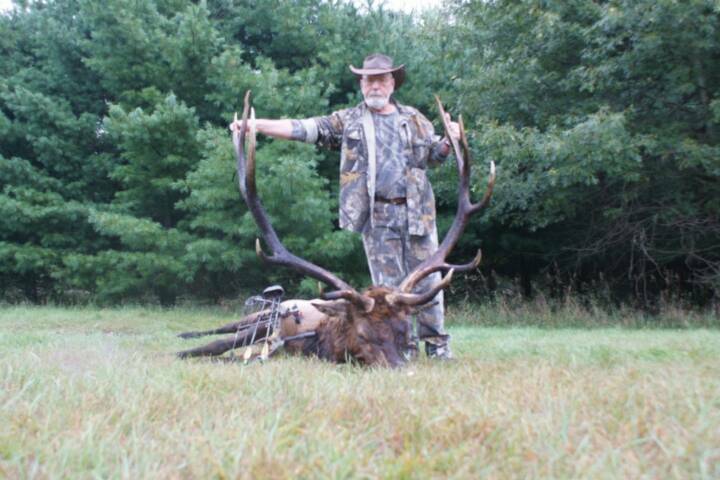 Hunting season 2011 has begun as of Sept 1 and some beautiful Trophies will be adorning the walls of these Hunters Trophy Rooms. Brothers Tom and Kevin from NC. came to Little Tex to score on some beautiful Elk, Fallow and Sika deer Elk-377"
Nothing like a little family competition. David V. and his wife spend some quality time together at "Little Texas". Dave scores on a true 30 pointer. We know what song he will be singing for awhile. 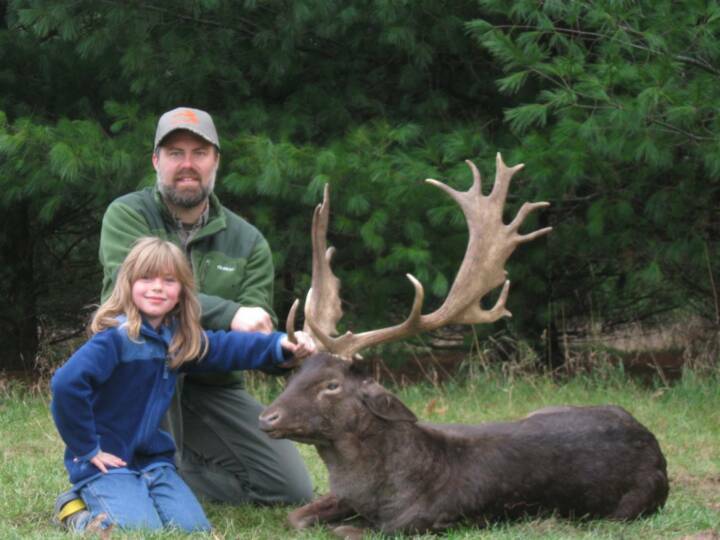 Quality Fallows taken once again from "Little Texas"